The books are simple to make, although if you’re thinking of preparing blank ones to use in a group rather than a home situation, I’d recommend using a guillotine! They don’t need glue and you could use a white cover if you prefer, although I think the coloured covers really add something to them. 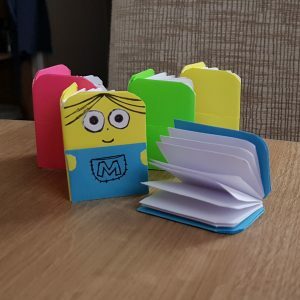 You can see the video tutorial I used HERE where she uses them to create Minion books. I think making Minion style Bible characters would definitely be up some people’s street (check out my Minion Mary! ), but of course you can create any sort of characters you like. If you’d like to use stickers, you’ll find some useful ones in the book Our Christmas Family GodVenture, plenty to make a whole nativity set, or whatever Bible story you choose. For younger children this might be a fun way to create the characters. Older children might enjoy colouring or gluing paper on like RedTedArt does. 3 Choose four ‘silent’ or ‘invisible’ characters such as Mary’s Mum, Joseph’s brother, a shepherd boy, and a camel boy who travelled with the wise men. As you can see, this can work for any Bible story. Most children will prefer to choose who they create. Some may like to make a set. Alternatively, you might like to make a set to send to someone for them to explore a story in a new way. · Draw patterns, pictures or simple colours to reflect how they felt at different points of the story. To adapt this style of book for younger children, you could start with A3 paper which will give you a a larger space to work in. If you use this in a group of intergenerational service setting, you could get a team together one evening (with cake!) to make lots of blank books with different colour covers and have them in a basket on a table with pens for people to use them in the way which helps them explore.